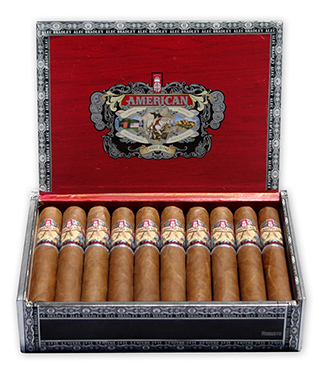 Alec Bradley's patriotic-inspired American Classic cigars are blended with specially-aged Nicaraguan Esteli and Condega long-fillers, Nicaraguan Jalapa binder, and a Honduran-grown Connecticut Shade wrapper giving the mild to medium-bodied cigars a smooth, sweet, and complex profile. "We wanted to make an affordably-priced handmade cigar like the cigars that were popular in America during the early part of the 20th century," said Alan Rubin, president of Alec Bradley Cigars. Though the blend was a challenge to create, they eventually found just the right tobaccos and created a true "American classic" cigar with a great balance of flavor, complexity, and depth at a terrific price. Light up an American Classic cigar and experience a very smooth, creamy smoke with sweet cedar notes and a distinct nutty flavor on the finish.